This book is about bankruptcy. That doesn't sound like a very political topic, but it is. This is how Elizabeth Warren made her name, politically. This book was written in 2007 (with a new introduction in 2016), while Warren was a Harvard Law School professor, and not known nationally. The book was her main credential for getting appointed to the federal positions (dealing with the TARP federal bailout), and those federal appointments became her Launchpad for her Senate campaign in 2012. Why bankruptcy? Warren considers the bankruptcy reforms of 2005 to be pro-corporate and anti-consumer. Corporations (such as banks or stores that issue credit cards) were much more likely to get repayment under the new bankruptcy law than the old one; and consumers were much less likely to be eligible for bankruptcy under the new bankruptcy law than the old one. Warren supports bankruptcy for people -- noting that companies still file for bankruptcy without guilt (p. 171); that the stigma of bankruptcy has not faded away under the new bankruptcy law (pp. 71-2); and that the new bankruptcy law is just part of a larger pattern of corporate deregulation that should be reversed (p. 147). The title of the book refers to women entering the workforce in the 1960s, but despite the higher income level that would appear to give families, the number of bankruptcies still increased since that time. Warren points out the increase in bankruptcy falls disproportionately on women (p. 5 and 11), and that having a child is the strongest predictor of filing for bankruptcy (p. xiii-xiv). In other words, even though women work now, and two-income couples have become the norm since the 1960s, middle-class families have not benefited from having a financial cushion of the second income. 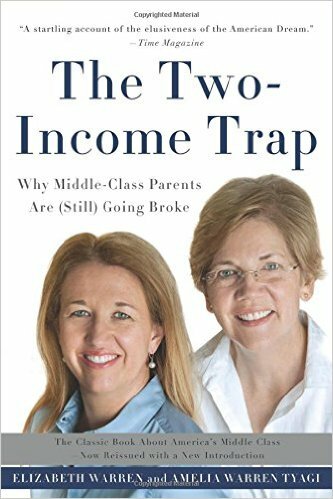 The "two-income trap" means specifically that family lifestyles have changed to the new two-income norm, and losing EITHER income causes a financial crisis (p. 81-2). Warren's most important federal accomplishment, prior to getting elected to the Senate, was to establish the Consumer Financial Protection Bureau in 2010 (she was never appointed to that bureau, but was instrumental in its founding). The CFPB is intended as the financial equivalent of how the federal government requires labels on food products -- i.e., require information about how loans work, so that "predatory lending" becomes less likely to claim consumer victims. That's part of "The Two-Income Trap," too -- working couples get "predatory loans" -- for housing, education, or whatever -- from which they end up in massive debt. So what is the source of the "Two-Income Trap", i.e. what has caused the vast increase in bankruptcies in recent decades? Warren acknowledges that maybe people attribute bankruptcy to splurging on consumer goods-- but then demonstrates with countless charts and tables how that's simply untrue. People have not spent massively more on food & restaurants, nor on household appliances, nor on vacations -- some categories have risen those have been balanced out by advances in technology. People HAVE spent massively more on buying their homes, college tuition, and healthcare -- hardly a pantheon of frivolous spending. And people don't declare bankruptcy because they have racked up credit card debt on consumer goods either -- most people declare bankruptcy because one of the working parents lost their job for longer than expected, or some medical bills came due, or they got foreclosed upon because they couldn't keep up on the mortgage when one of those occurred. The "Two-Income Trap" means that crisis was much rarer in the 1950s because, if dad lost his job, mom could go out and work part-time while dad was unemployed. In other words, sending a housewife into the paid workforce provided a built-in financial safety net which is now gone. So what is the solution to the "Two-Income Trap?" Warren does not recommend that mothers stay home with the kids, to rebuild that built-in safety net -- instead she recommends providing a government-based safety net for the three items listed above as causing financial crises. For medical bills, she recommends more catastrophic insurance -- do it yourself, she says on p. 166, but ObamaCare has partly addressed that since then. For college tuition, Warren recommends a tuition freeze at all state-sponsored colleges (p. 46), which has become a key plank in the Democratic Party platform in 2016. And for ever-upward-spiraling home prices, Warren recommends school vouchers -- most definitely NOT a key plank in the Democratic Party platform in 2016 -- because a town's school system is the biggest determinant of home prices, and students could then commute from cheaper towns to better schools. That last item is a major litmus test of a progressive philosophy vs. a liberal philosophy. Progressives like Elizabeth Warren (and Robert Reich and Arianna Huffington) support vouchers; liberals like Hillary Clinton disdain them. Is that disagreement enough to keep Warren off of a Clinton-Warren ticket in 2016? No, we don't think so -- Warren would simply say "I yield to Hillary on this issue" -- Joe Lieberman made the same switch in 2000 at the request of Al Gore to form the Gore-Lieberman ticket. School vouchers are not a core belief for Warren, so she'd yield. Warren DOES have some core beliefs where Hillary Clinton disagrees, which ARE enough to make a Clinton-Warren ticket in 2016 challenging. And this book explores those disagreements in detail -- Warren outlines a long story of how she personally educated Hillary on bankruptcy in 1998 (p. 125) which led Hillary to persuade Bill Clinton to veto the bankruptcy bill. But then later, in the Senate, Hillary voted for the same bill (p. 156), for which Warren criticizes Hillary as beholden to the financial industry for campaign donations (Bernie Sanders made the same criticism in the 2016 primaries). Can they come to some compromise on that issue? Maybe, but it seems more likely that Hillary will pick a moderate liberal rather than continuing the progressive fights she had with Sanders in the primaries. Elizabeth Warren: A generation of I-got-mine policy-making has failed. Hillary Clinton: 1998: Opposed bankruptcy bill; 2001: supported it. Elizabeth Warren: Businesses aren't guilty over bankruptcy; neither should you. Elizabeth Warren: Invest in public education & universal preschool. Elizabeth Warren: Medical problems cause 750,000 bankruptcies each year. Elizabeth Warren: Middle class built by investing in infrastructure & research. Elizabeth Warren: Strong safety net is needed now more than ever. by Elizabeth Warren and Amelia Warren Tyagi.